Seriously. What do mums do if sewing isn’t their thing? 4 year old Kiddo is starting school in 2 weeks; he’s a tall enough but a wiry little kid rather than a solid/ chunky wee man. Meanwhile his school sweatshirts come in size 3-4 and then 5-6. What the?! Isn’t there a whole age they missed out there? The 3-4 was too tight for him to get on and off himself, so I got the 5-6 and convinced myself he would grow. A lot. In 2 months. He’s played, he’s eaten (well as much as he’s ever going to), he’s slept, he’s run, climbed, learned and laughed (a lot) – he’s done pretty much everything a kid should. Except grow those arms! The age 5-6 is comfily baggy but not outrageously big everywhere else – except for those neanderthal arms which are literally falling way down below his hands all the time. Grrrr. I defy any child to learn to write or draw like that. And I defy any parent to teach a 4 year old boy to roll up their sleeves. Teaching them not to shout “poo-poo pants!” in an alarmingly mock-tourette way to break the tension of formal silence is enough achievement for mums of small boys to feel they deserve some kind of award. So here goes if you have a similar problem, or maybe need to buy a bigger size for your child’s body but struggle with the long arms. Now, because although I’m not in ANY WAY a clothes maker/ alterer (a sewist but rarely of clothes) and I winged it, I’m calling it a life-hack. And because that sounds unashamedly cool. 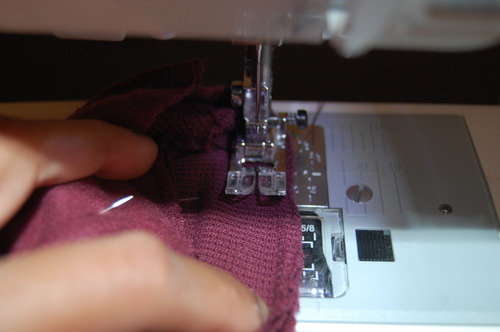 If you are comfortable sewing with a machine it’s pretty easy (I think). I was lucky to have a secondhand sweatshirt to practice on before cuttting up the new one, so you might want to do have a practice run too (though my prototype run turned out fine too). 1. Right. 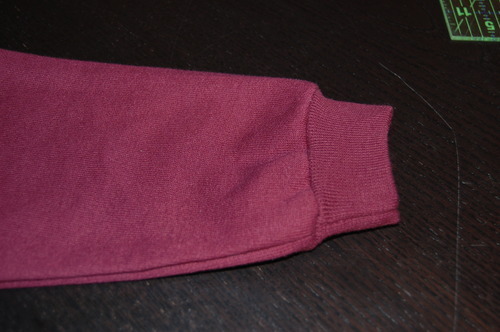 Well this is what the original cuff of the school sweatshirt looked like. 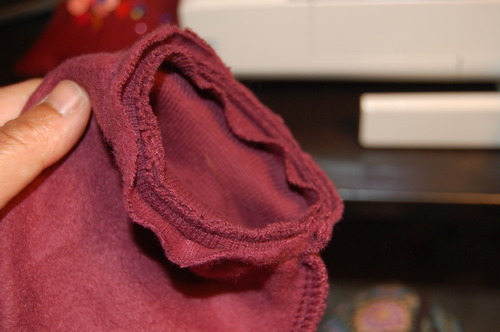 My cuff looks smaller afterwards, because I took a bigger seam allowance than I probably needed to, and I didn’t topstitch afterwards (because that was never going to look this neat). 3. Arm yourself with a good sharp seam-ripper – and unpick all those stitches. 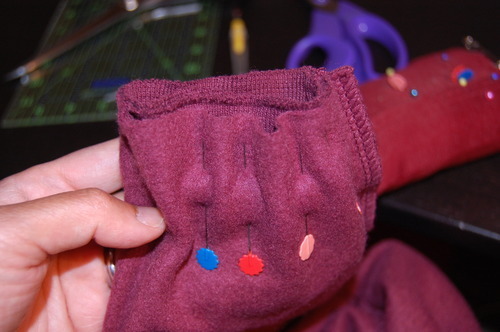 You want to unpick all the stitches which attach the cuff to the sleeve. It takes a while. Have a cup of tea to hand, maybe some tunes and take your time. 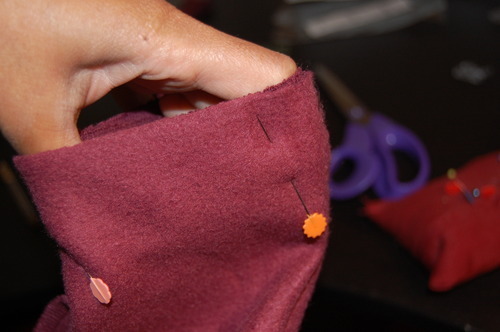 You especially don’t want to damage the cuff itself – the sleeve you’ll be cutting off anyway. 4. Done? Good. At this point you need your model. Bribe child with chocolate to get him to put on the sweatshirt and stay still for 30 seconds whilst you decide where you want your new sleeve to end. 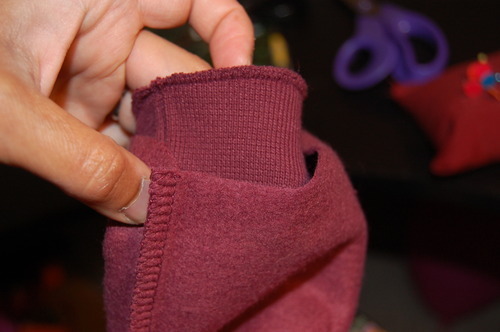 Mine was about 3 and 3/4 inches from the end of the sleeve*. 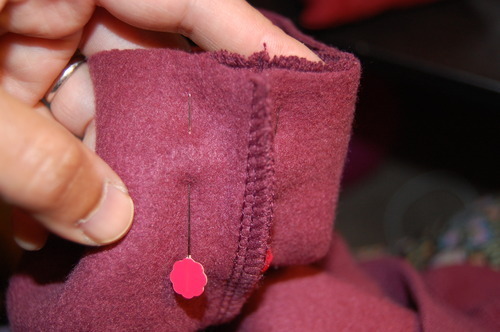 Next subtract about 3/4” from that to allow for your seam allowances when you sew your cuff back on. So I needed to cut off 3 inches. I left the sleeve just slightly long (maybe up to his first knuckles) to give some growing room but keep his fingers free. Freakily different sizes huh? It didn’t matter too much for this sweatshirt as it wasn’t too much bigger than the original difference but see below if yours is a much bigger difference. 7. Turn your sweatshirt inside out. 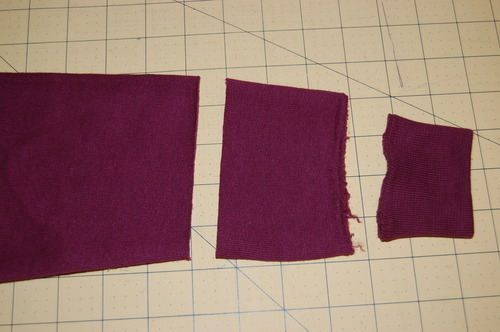 Put the cuff into the cut end of the sleeve, raw edges matching at the top – and the seam line matching. 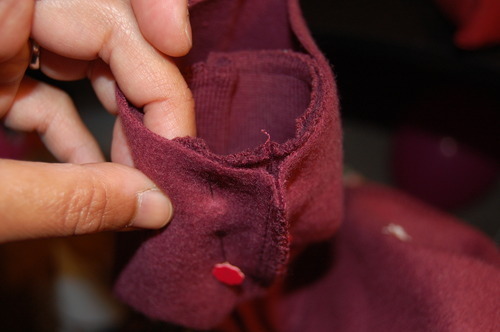 There should be no “right” or “wrong” side of the cuff as they seem to be double sided and folded over, but if there was, you would put right-sides together. 10. …and pin the opposite side, then pin all the way round. Pin like crazy baby! The more the better. 11. And when you let go, the cuff will spring back giving a puckered look. This is completely fine..
12. 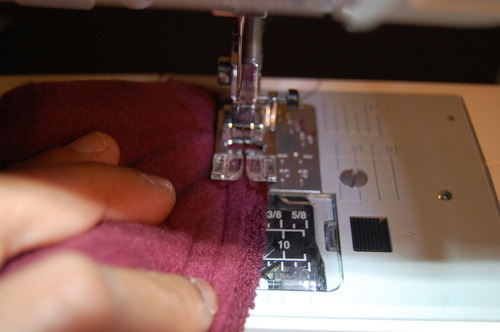 Take to your trusty sewing machine. At this point I wished the sleeve went round my machine, but the sleeve diameter was too tiny. Still I was just a bit careful and it was very straightforward. 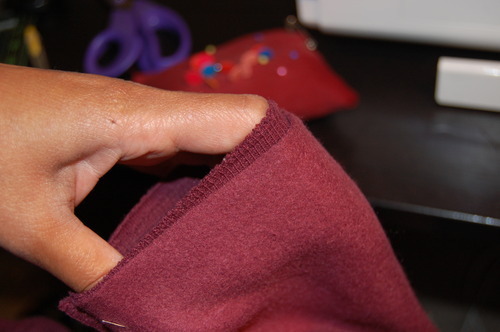 I sewed on the inside of the sleeve/cuff as Ifelt I could see better what I was doing that way and ensure I wasn’t sewing through the other side. 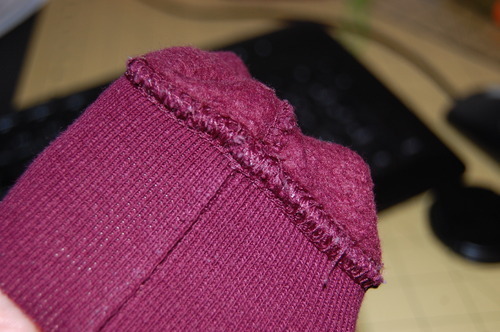 Taking a 3/8” seam allowance (you could make this smaller if you like), carefully sew the raw edges of cuff and sleeve together. 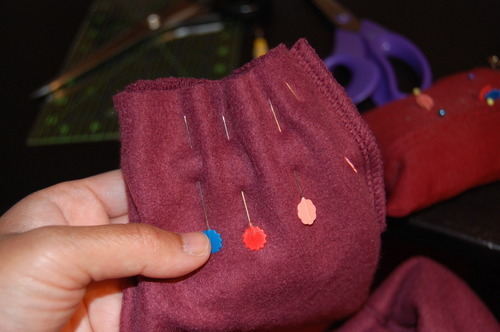 Make sure you stretch out the cuff to ensure the sleeve is nice and flat as you sew. The cuff will spring back just fine. Sorry, these are not natural sewing pictures – I was using my right hand to take a picture and clearly not actually sewing. 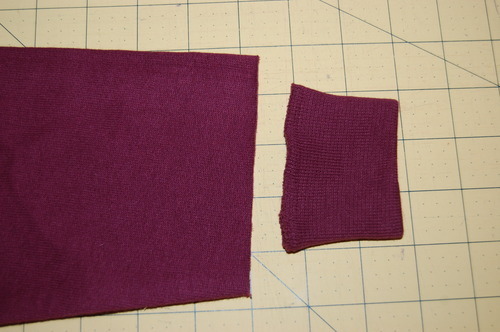 You can see the sleeve fabric is not bunched up and the cuff fabric is stretched to lie against it nicely. sew all the way round. 13. Backstitch to finish and take it off the machine to admire, and check the right side looks good. 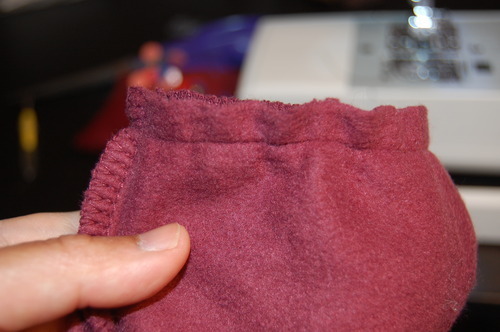 By the way, I used a universal needle, polyester thread and a straight stich with normal tension and pressor foot and it was all OK, but you could test it all on the scrap you cut off the sleeve if you like. 14. That is still the reverse by the way. Pretty! Not. 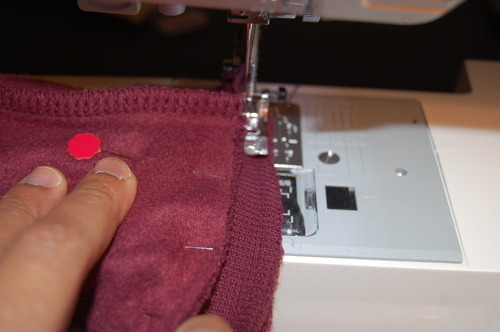 Never mind, put it back on the machine and zigzag round to finish the seams. 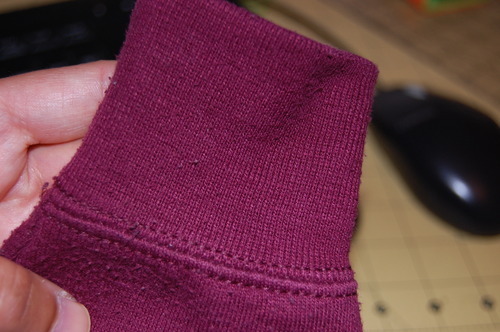 I warn you, on my practice sweatshirt I first did a fancy tight overlock-type stitch, and it made it very stiff and possibly annoying to wear I’m guessing, so on the others I just did a gentle, fairly loose zigzag. To be honest the raw edges felt nice and soft and I almost left it like that for comfort, but I wasn’t sure how long it would take before they unravelled, so chose to zigzag the edges. 15. Turn inside out – and beam. Try it on your wee man who will say “Oh! It’s good!” quickly followed by “I want to take it off” before running away to play some more. Back to prettiness next time folks. Meanwhile enjoy the summer and whatever it is that makes you feel proud.